With a capacity crowd and a beautiful night for baseball, the Augusta GreenJackets (Low A; Sally League) opened SRP Park Thursday night to much fanfare and hoopla—and the ballpark, which debuted after years of planning, was up to the heightened attention. Located across the Savannah River from the edge of downtown Augusta in North Augusta, South Carolina, SRP Park is the centerpiece of the Riverside Village development (known formerly as Project Jackson). A modern mixed-use development, Riverside Village is an ambitious project undertaken by the city and investors, including Greenstone, the Atlanta-based investment firm that includes Chris Schoen, part of the GreenJackets ownership via Agon Sports & Entertainment. MiLB veteran Jeff Eiseman heads Agon Sports & Entertainment; during a pregame tour he explained the philosophy behind the ballpark as well as its place in Riverside Village. In short: Eiseman sees the ballpark as much more than just a ballpark, capable of hosting events 365 days a year. That’s the stated purpose of many ballpark operators these days, but SRP Park features enough tools to make this a definite reality. The vision behind the $183-million Riverside Village is a live/work environment, featuring a Crowne Plaza Hotel and Conference Center, Class A office space, restaurants, apartments, condos, senior housing and retail, some of which will be located in the ballpark. Right now the entire Riverside Village area is a huge construction zone; some of the apartments and a parking ramp are completed, while work still needs to begin on other elements, including nearby office space. The ballpark, however, is already exceptional on the fan side of the experience, with plenty of new features to come in the future. It was easy to see where the ballpark will end up at the end of the construction experience. With the Riverside Village development expected to generate plenty of foot traffic and draw in plenty of events, flexibility is a big capability throughout the ballpark. In a unique setup, two prominent spaces are set up to be multiuse venues. The team store next to the main entry can be used for group events: all the merchandise carts are wheeled, while the wall displays can be removed. The upstairs WOW! Club has a bar that can be broken down and reconfigured for different events or removed completely if need be. That meant no running water or fountain drinks at the bar, but the flexibility allows for larger events in the space. Like many new ballparks opening these days, SRP Park is really a series of discrete spaces wrapped together as a whole, and the success of such a facility depends on how well these spaces work together. In general, they work together well at SRP Park. Ten suites in the upper concourse provide respite for those wanting some privacy and corporate entertaining spaces. The aforementioned WOW! Club spills out with outdoor seating on the playing-field side and an outdoor lounge opposite. On the other end of the suite level is the South Carolina State Dispensary bar area, a small space honoring something previously located on the ballpark site: a South Carolina State Dispensary for alcohol distribution. The state held a monopoly on liquor sales from 1893 to 1907, and it looks like some of the product was consumed on site, judging by the bottles uncovered during the construction process. For families, a kids’ area in center field features plenty of inflatables and a mister, while other families were camped out on a small berm and picnic table in the left-field corner. The 360-degree concourse features drink rails throughout, and they were in heavy use thanks to the millennials occupying vast spaces of the ballpark. (Millennials at MiLB ballparks pose some interesting challenges. On the one hand, they love to descend in groups and camp out next to drink rails, jumbo beers in hand. On the other hand, they don’t seem to buy a lot of merchandise, or at least at the levels that older fans do.) The suites were sold out for the 2018 season, as were several other spaces: VIP Loge Box Premier Boxes (shown below) and both 1st Base Club and 3rd Base Club seating. The right-field corner contains two group areas that can be combined into one large group area. They feature plenty of half-moon and four top tables. One other interesting twist to SRP Park: the ballpark LED lighting system from Musco can be synchronized, with sections of the lighting on individual poles turned on and off. Since LED lights turn off and on instantly, they can add interesting effects to pregame ceremonies. There’s also spot LED lighting on the grandstand featuring multiple colors. 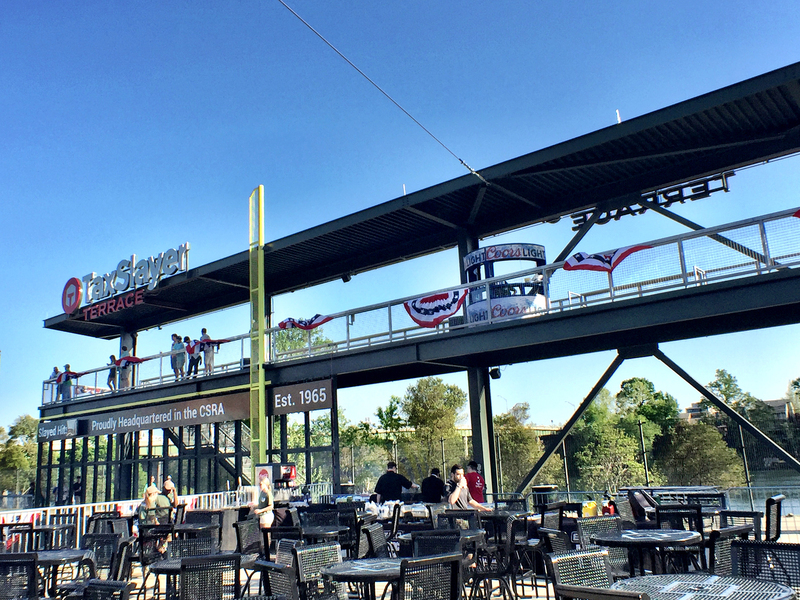 Also located in the right-field corner: the TaxSlayer Terrace, which provides a great overlook to the entire ballpark on one side and the Savannah River and downtown Augusta on the other. It’s a great spot for standing around and watching a game with friends; the photo below was taken an hour before the game started, and fans were already staking out the spots at the bar rail. During the game, of course, it was a prime gathering spot for millenials, and we guess it will be even more crowded when the connected Sweetwater Brewing Co. building opens (which we discuss below). You can see the view from the TaxSlayer Terrace in the photo at the top of this page. The design eschews the darker brick found throughout most of Augusta in favor of a lighter-shaded brickwork that adds lightness to the ballpark. There’s also a more pronounced Southern aspect to the second-level concourse, where shutters and strategically placed rocking chairs are accent points. The ballpark also pays some subtle tributes to Augusta’s history as the host site of The Masters tournament, but it’s not overt. A Front Nine Grill and a Back Nine Grill are located in each corner, while a Budweiser Back Nine Bar & Lounge is located down the left-field line. While the fan experience is already very good, there’s still plenty of work to be completed at SRP Park. As noted, there will be a separate retail area opening to the outside offering some accessibility to fans on game days. The player facilities are roughed in, but there is plenty of finishing work ahead. (They’ll be worth the wait. The clubhouses are huge by Class A standards, located past the left-field concourse.) Some of the player space will be viewable from the concourse, but a final configuration of that area remains to be finalized. A building hosting a Sweetwater Brewing bar on the second floor and a smokehouse on the ground level, next to a Sweetwater beer garden, is still under construction. (In a cool move, work was being done on the space during the game.) And more concessions stands and points of sale are on the way. Despite the fact that some major portions of the ballpark are unfinished, the vision that underlines the ballparks and its place in an ambitious development is clear. The GreenJackets are obviously walking a tightrope here: opening a ballpark in the midst of a construction zone is always a risk, but the fans of Augusta didn’t seem to mind, even when faced with some long concession lines. (Yes, there are always long lines when a new ballpark opens: the staff is still getting used to the concession equipment, and there are always kinks in the process.) These fans patiently attended games at Lake Olmstead Stadium as the development planning process cleared political and legal issues, and they are now being rewarded f0r their patience. We’re guessing the fans will find a game experience to be so good that they will put up with some inconveniences — which will make the future improvements even more noteworthy. Change will come rapidly to SRP Park, and it will be fascinating to see it at the end of the season as well as in 2019. Directions: Railroad Avenue runs parallel to the Savannah River. However, parking is an issue because of all the construction in the area. Rather than assuming you can drive directly to the ballpark, we suggest you plan with the GreenJackets’ guide to parking in the area.